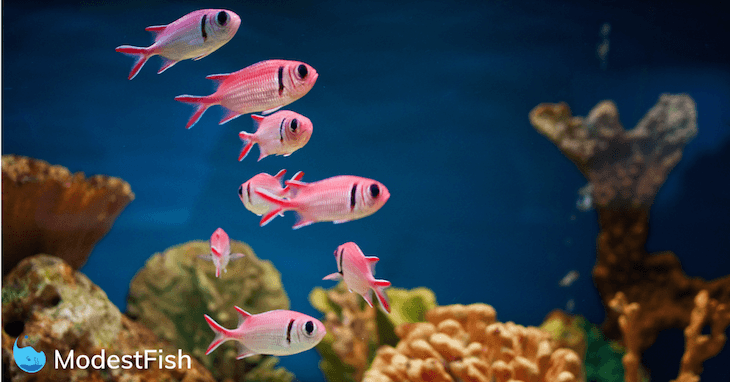 A protein skimmer is a key component to a reef tanks filtration system. Using a good-quality protein skimmer will increase your odds for success. That’s why I’ve completed this research for you. And in this article, we’ll go over what you need to know about protein skimmers – so you can choose the best on. 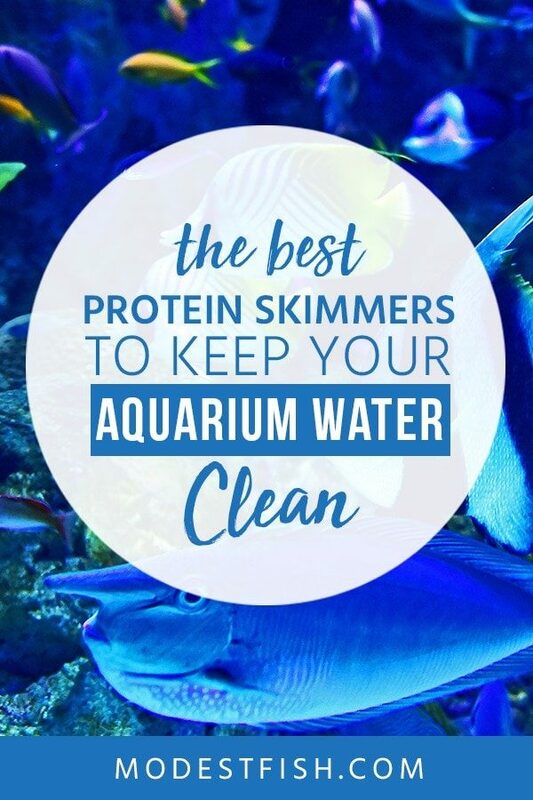 Then, I’ll share some of the best aquarium protein skimmers currently on the market for you to check out. **Before reviewing the individual protein skimmers, I’d like to talk to you about how you can effectively choose one for your current setup. Otherwise, if you’re just here to get a detailed breakdown, you can jump to the review section by clicking here. Skimmer pumps work by producing tiny air bubbles which proteins and waste will attach themselves to. They then rise up and spill into the collection cup. It’s an important job, so let’s take a look at what you need to consider. The most vital part of a protein skimmer. Because that’s what produces the waste carrying bubbles. The best protein skimmers often include a needle wheel impeller – which will chop incoming air into even smaller bubbles. The better impellers will produce a lot of tiny bubbles. Smaller bubbles increases the surface area – removing more waste. High-quality pumps will last longer, run quieter, and transfer less heat into your aquarium. The bigger the reaction chamber, the larger volume of bubbles it can produce. Attracting more proteins and increase the contact time. Resulting in more waste removed. One you definitely don’t want to overlook. A smooth path from the body to the collection cup is what allows the bubbles to easily rise and fall into the cup for easy removal. Look for a protein skimmer with an easy to use outlet adjustment. It’s helpful because it’s likely you’ll want to adjust the water level inside your skimmer. You’ll be able to fine-tune your skimmer for a steady skimmate produce and avoid overflows. This is more common on the most recent models, they work to reduce turbulence and increase contact time. An air silencer will help to reduce unwanted noise disturbances. And collection cup drains help to reduce the amount of maintenance needed. Putting performance to one side for a moment, you should consider the quality of materials. There’s no point having a high-performing protein skimmer if the materials breakdown. Higher-quality materials will be more durable and resistant to damage. Cast acrylic is considered the best material, followed by extruded acrylic and plastic. Going with a well-known brand is always a good idea, especially if you’re not the most tech savvy hobbyist. You may find you need technical or warranty support at some point. An established company with a good customer support team who will help you during setup, or if something goes wrong really adds value. AquaMaxx, Reef Octopus, Vertex, and Tunze are currently some of the best to date. 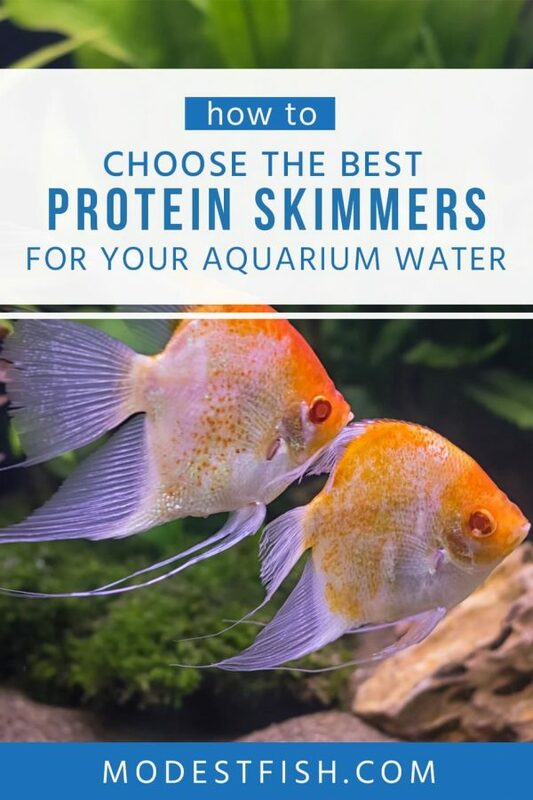 Now you’ve got a better understanding on how to choose a quality protein skimmer that’s right for your setup, you can use the following product reviews to decide which one is best for you. Combining high-performance and low-power consumption, the Tunze USA is excellent at producing millions of tiny bubbles. 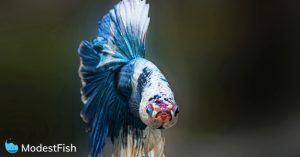 With a flow rate of 237 gallons per hour – it’s recommended for saltwater aquariums up to 265 gallons (fish only) or 80 gallons (heavily stocked SPS). They’ve built their silencing feature between the cup and body. Making it very quiet and moistening the air intake. Because the needle wheel pump only draws in humid air, it helps to prevent it from clogging. You don’t have to spend as much time cleaning the air intake. 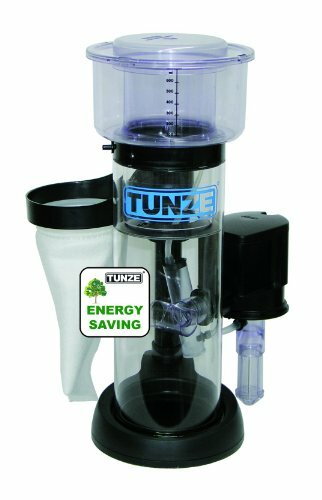 The Tunze Hydrofoamer combines high performance and low power consumption (15 watts). Creating millions of tiny air bubbles with a diameter between 0.1 and 0.3mm. This helps to ensure quiet and efficient skimming. Cleaning is simple, you get an easy to use ‘feed’ button, which pauses the pump for ten minutes. This is more than enough time to clean the easily removable skimmer cup. A self-leveling feature means you don’t have to adjust the water level with a riser or wedge pipe. The only adjustment made is with the controller, and it’s not very hard. Pump threads onto the skimmer’s body. Can be a slight hassle to remove. Featuring a space-sensitive footprint, the narrow neck design helps to maximise skimming power. A quick-release collection cup and body makes it easy to maintain. Rated for up to 140 gallons; the recommended size is roughly 65 gallons. It’s not the most compact skimmer, but it does have a very small footprint: 7.28” x 7.08” x 18.5”. A narrow neck design helps to maximize skimming power, and helps to ensure there will be fewer tensions as the bubbles rise up. The wine glass body reduces turbulences and provides a powerful performance while only using 8 watts. The needle wheel is quiet and works great. However, there is a break-in period of about 2 or 3 days, during which. So you may have to place it above the recommended water level. A quick-release collections cup and skimmer body makes it easy to disassemble and clean. And a draining feature helps to lengthen the time between maintenance. Easy to set up. 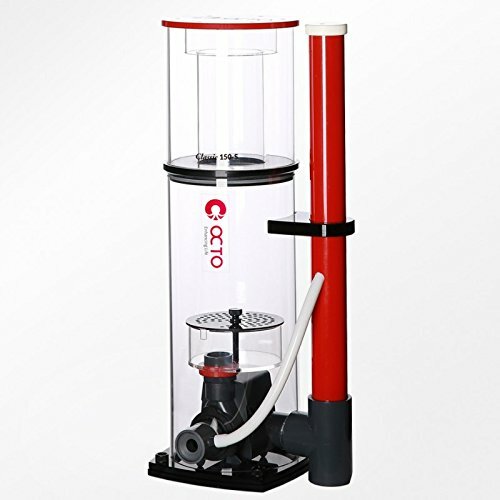 The air venturi is setup for you, and you’ll only have to set the water flow using the red knob on top of the hard plastic tube. The sleek and compact design is ideal for anyone working in tight spaces. It's quiet, powerful, and energy-efficient, so you'll want to check this one out. This sleek and compact protein skimmer really is a ‘space saver’. With a footprint of 7.3” x 9.45”, it’s rated for up to 100 gallon aquariums. Constructed from durable high-quality acrylic, it can be completely disassembled for cleaning. It’s designed for in-sump use only – no feed pump required. It will draw water direct from your sump. It’s quiet due to it’s vented wedge valve output and Aquatrance pinwheel. The pinwheel produces a brilliant mix of water and air, and is efficient at removing waste. The wedge valve allows for excellent control, and funnels the clean water out below the water line. This is how it achieves a very quiet operation. A German-engineered protein skimmer, it's lattice-shaped bace and narrow needles produce fine micro air bubbles. 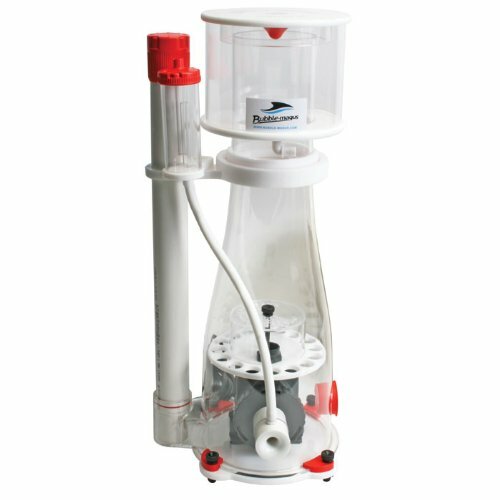 Quiet and efficient, this is a top of the line skimmer. 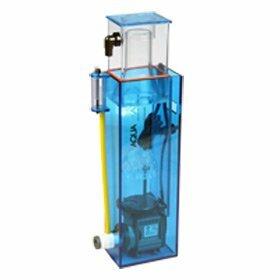 This German-engineered pump is rated for up to 265 gallons, and features the NYOS Hybrid Wheel. It’s lattice-shaped base and narrow needles produce very fine micro air bubbles. Energy efficient and quiet, it’s four rubber feet absorb vibrations. Making it as silent as possible. The bubble plate is cool, it’s called the NYOS Twister, and it spins the water/bubble mixture into a high-velocity vortex – looks like a tornado. It doesn’t only look cool, it increases the contact time and improves the skimmate. You can control the air and water volume independently with separate adjustments. Both are easy to use and clearly labeled. And as you’d expect with German engineering – it’s constructed of high-quality clear acrylic. Even the impeller housing is clear, you can watch it in action and spot any potential problems from the outside. The attention to detail in build quality is something that stands out. Even down to the titanium screws. All the screws will fit every hole, so there’s not fussing when you’re setting up. And titanium means they won’t corrode – adding to it’s long-lasting durability. A long time fan favorite, the AquaMaxx HOB 1 has been desgined with you (the hobbyist) in mind. Easy to use, and an excellent performance can make this a great option for a beginner. This is one of the industries most favored skimmers, and for good reason. It’s designed from the ground up with the hobbyist in mind. Rated for 50-75 gallon tanks, it’s suitable for nano aquariums. It’s made from solid acrylic and uses an Italian Sicce Syncra 1.5 pump and AquaMaxx needle wheel impeller. These provide outstanding performance with a quiet operation – Creating a strong mix of small air bubbles and turbulent water movement. It does a great job of forcing protein, waste, and other materials into the collection cup. It’s designed to have the pump inside the skimmer: saving space, reducing noise, and improving efficiency. The bubble plate helps to reduce turbulence inside the actual chamber and increases dwell time. It’s effective at removing a lot of waste. Easy to clean, the collection cup is a breeze to remove and have a convenient skimmer drain line. You’ll also get the option (sold separately) to add a bubble stopper. It attaches to the outlet of the skimmer to catch escaping microbubbles. So, which is the best? For me, it comes down to two–depending on your budget. 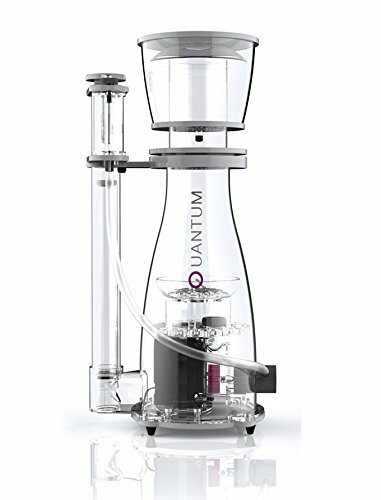 If you’ve got the money, I can’t recommend the NYOS Quantum 160 any more. With outstanding build quality, very effective skimming and near silent operation; you definitely get what you pay for. But, if it’s not in your budget your best option is the AquaMaxx HOB 1. High-performance and quiet operation makes it very good value for money. It’s no surprise it’s such a popular choice with hobbyists. 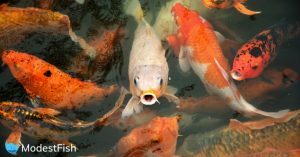 Your aquarium contains a lot of naturally occurring organic compounds and tiny organic particles. Including uneaten and digested food from fish and corals. If left, these will create an environment where disease-causing organisms can thrive. And will decompose, causing increased levels of phosphate, ammonia, and nitrate. Your protein skimmer will work to remove these before they oxidise and harm the health of your tank. Removing these dissolved and micro organic matter will improve the transparency of your aquariums water. Bad organics in your aquarium will absorb some of the light waves your coral need to help maintain a healthy growth rate. Removing them can make it easier for light to penetrate the water and reach the corals.